What Makes The Perfect Pearl? We asked our resident gemologist and instore expert Claire Hall for an insight into the lustrous world of the pearl– just what is it that makes them such special addition to any jewellery collection? 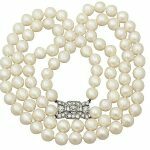 Pearls are making a fashionable comeback, and no longer just for the traditional twinset and tweed group. Pearls were seen to adorn clothes, jewellery and accessories all over the catwalk in the 2016/2017 season. They were even spotted at Chanel, Gucci, Miu Miu and Dries Van Noten, to name but a few. The concept of the perfect pearl is an elusive one. 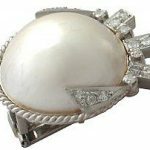 As with all gemstones and precious materials, the nature of its natural creation means that it is impossible to control the final result/ how ‘perfect’ the pearl will be. This unpredictability is a facet of their allure. The perfect pearl depends on a myriad of contributing factors, namely: shape, colour and lustre. Obviously, the most commonly desired shape of pearl is the perfect sphere. This is the shape which is used in most jewellery, particularly pearl necklaces. However, specific pearl shapes can be fashioned to custom requirements by applying a mould to the inner wall of oyster shells. 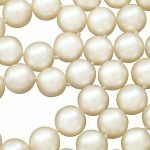 Blister pearls or mabé pearls for example, can be created by a pearl growing over the mould. This means that the perfect pearl can be grown in almost any shape you like! The colour of the perfect pearl is also subjective. The most popular and sought after pearls are those with a pink iridescence. However, those with purple, blue and green iridescence are also desirable. These individual hues are found by choosing specific types of oysters within certain regions which are known to produce a more saturated level of a particular colour. The lustre of a pearl is another contributing factor towards whether as pearl is deemed ‘perfect’. The levels of lustre range from AAA (very lustrous, a high sheen) to A (some lustre, low sheen). This lustre is technically a pearl’s brilliance, or the amount of light which it reflects. It is the same term used to describe the amount of light refraction and reflection in diamonds. The perfect pearl can be either natural or cultivated. Because it is far more rare to find exceptional natural pearls however, these are obviously of higher value. 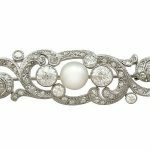 Generally speaking, any item of jewellery incorporating a pearl or multiple pearls created before the turn of the twentieth century can be assured to contain natural pearls. Since this time, however, cultured pearls have become the most common. Natural pearls were over-harvested during the nineteenth and early twentieth century. This resulted in a depleting supply, and a consequent increase in price. 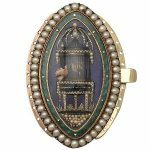 The perfect pearl is – as with most jewellery – a subjective ideal. So whether you prefer an iridescent pink pearl or a perfectly symmetrical treasure, what makes the perfect pearl is completely up to you!